Written and directed by Wim Wenders, Im Lauf der Zeit (Kings of the Road) is the story of a film projector repairman who saves the life of a psychologist from an accident as the two travel through Germany from one rural movie theater to another. The film is the third and final film of a thematic trilogy set on the road as it play into two men bonding in the course of their journey while finding solace in cinema. Starring Rudiger Volger, Hanns Zischler, Lisa Kreuzer, Rudolf Schundler, Marquad Bohm, Dieter Traier, and Franziska Stommer. 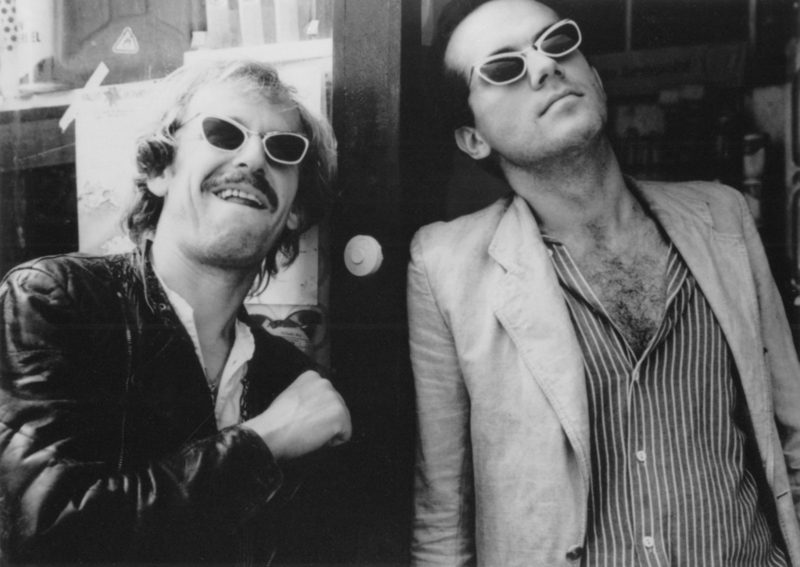 Im Lauf der Zeit is a ravishing and exhilarating film from Wim Wenders. Traveling through small villages and towns in West Germany, a film projector repairman meets a depressed psychologist who crashed his car into a river as they both travel and deal with their lives. It’s a film that does take a simple premise of two men traveling as they stop at cinemas to repair movie projectors as well as ponder about the world around them. Wim Wenders’ screenplay largely focuses on the journey of these two men where the film projector repairman Bruno Winter (Rudiger Volger) is traveling village to village to fix projectors at small cinemas in these villages where he watches psychologist Robert Lander (Hanns Zischler) crash his car into a river in a half-hearted suicide attempt as he’s reeling from his break-up with his wife. Lander joins Winter on the trip through West Germany from village to village as they go to cinemas to fix film projectors as the cinemas are a place of importance for these small towns still dealing with the guilt of war. Along the way, the two would meet individuals while also going on a separate path where Lander visits his father (Rudolf Schundler) while Winter meets a cinema cashier in Pauline (Lisa Kreuzer). Wenders’ direction is definitely astonishing in terms of the locations he sets the film at where it’s in these small villages in West Germany where its destination is towards the East Germany border as the country was divided during the Cold War. Shot around the summer to the early fall, Wenders would emphasize this air of simplicity in these small towns that are definitely disconnected from the modernist big cities that have moved away from the past. The locations would add to this world that hasn’t progressed much yet have films as an escape from modern-day society where Winter would talk to a cinema owner early in the film about films while Winter is fixing a projector. Once Lander joins him, the two would look into their surroundings while meeting people on the journey as it play into not just loneliness but also loss which would force Winter and Lander to go on a separate path where they would rejoin each other during the film’s second act. Wenders’ direction also has this looseness in the compositions he creates in the usage of the wide and medium shots to get a scope of the locations while creating this amazingly rich sequence of Winter and Lander riding on a motorcycle. There are some close-ups in the film but Wenders is more about creating these striking images of these two men being one with their surroundings as well as play into their own melancholia about their lives. Even in the third act where they’re in a shack just near the East-West German border as it adds to the sense of the unknown but also the realization that these two men are both dealing with a loneliness in their lives as their trip is about to end. Overall, Wenders crafts a riveting and evocative film about two different men who travel through West Germany to see a world that is changing and unable to keep up with the modern world. Cinematographers Robby Muller and Martin Schafer do amazing work with the film’s black-and-white cinematography to play into the gorgeous look of the daytime scenes with its approach to natural lighting along with low-key lights for some of the interior/exterior scenes at night. Editor Peter Przygodda does excellent work with the editing with its usage of dissolves, transition wipes, and jump-cuts as it help play into journey on the road as well as the low-key moments during a few stops in the journey. Production designers Heidi Ludi and Bernd Hirskorn do fantastic work with the interior of Winter’s van as well as the interiors in some of the cinemas that Winter and Lander go to. The sound work of Martin Muller and Bruno Bollhalder is superb for its sound as it play into the natural elements as well as how a film project has to sound like. The film’s music by Axel Linstadt is incredible for its blues-based score with elements of folk and country as it adds to this energy and wonderment of the road while the soundtrack features music by Chris Montez, Heinz, and Roger Miller as it is one of the film’s highlights. The film’s wonderful cast include some notable small roles from Wim Wenders as a film viewer, Patrick Kreuzer as a young boy Lander meets late in the film, Franziska Stommer as a cinema owner that Winter converses with in the film’s beginning, Dieter Traier as a garage owner, Michael Weidermann as a schoolteacher, Peter Kaiser as a film projector who is more concerned masturbating to the film than showing the film properly, Marquad Bohm as a man who lost his wife as Lander helps him, Rudolf Schundler as Lander’s father who works at a printing press as he laments over the loss of his wife, and Lisa Kreuzer as a cashier Winter meets in town whom he spends the night with as they deal with the declining world of cinemas in small villages in Germany. The duo of Rudiger Volger and Hanns Zischler are phenomenal in their respective roles as Bruno Winter and Robert Lander as two men who go on the road as they deal with loneliness and lack of companionship as well as their surroundings with Volger as someone who loves cinema as well as his work despite the decline of cinemas in small villages while Lander is more low-key as a man dealing with depression as well as his own issues as both Volger and Zischler are major highlights of the film. Im Lauf der Zeit is a tremendous film from Wim Wenders that features incredible performances from Rudiger Volger and Hanns Zischler. Featuring a brilliant ensemble cast, beautiful photography, a minimalist story, a killer music score and soundtrack, and gorgeous locations through rural West Germany. It is a film that play into the idea of traveling on the road to see a world that is having a hard time adjusting to change while being an adventure that is more about personal than physical. In the end, Im Lauf der Zeit is a magnificent film from Wim Wenders. Your Blind Spot list is probably the most unique one going, and I love it for that. That's code for this is another I hadn't seen, but probably should.